All Madison WI and Dane County condos approved for FHA loans. Search for FHA-approved condos in Madison and all of Dane County. Then contact an FHA condo lender. Courtesy of your condominium specialists at DaneCountyMarket.com. You can identify Madison and Dane County condos approved for FHA loans by visiting either of the web sites below. Both of these web sites provide updated lists of condo developments approved for FHA loans. Either site allows you to search by State, City, Zip Code, and more. As an example: We searched by Wisconsin, Madison and a condo development- “Crosswinds at Hawk’s Landing”. The results it returned showed that Crosswinds Condos at Hawk’s Landing were FHA approved! But wait… the approval expired in 2012. 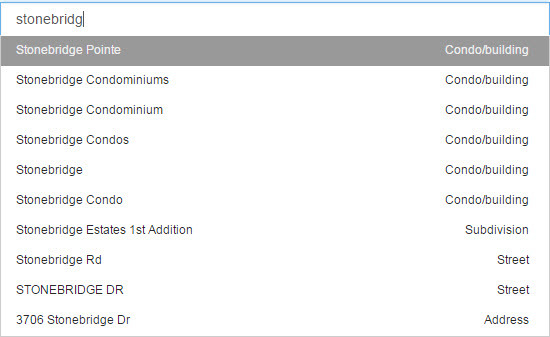 Next we searched “Stonebridge Condominiums”. This development showed up in the results as “approved” with the approval valid until March of 2017. Once you’ve found an FHA approved condo development of interest to you, use our condo search tool to find which units are currently available for sale. Search by condo/building to focus your search on the condo communities of interest to you. Simply enter the name of your preferred development within the search text box. The screenshot below shows a quick example. Selecting “Stonebridge” will return the following screen. Note: If you want to unlock some additional listing data (Days On The Market, Offer Status, Price Change History) you can learn more in this article. We are here to help and advise as you decide which of the condos approved for FHA loans that you want to purchase… We are here as a resource for you. You can request a showing or inquire for more information directly from the search results… Just click on “Request Showing” or “Inquire”… It’s not rocket science (kudos to you if you happen to be a rocket scientist). Please feel free to contact us using the form below or call the number at the top of the page with questions. We’re happy to help. If you’re looking to learn more about all of your condo financing options, we can put you in touch with a lender who specializes in the condo market.